Home>Latest News> How does the Lead Acid Battery Work? Learn about the differences within the lead acid family and find out what the cons and pros are. Invented by the French physician Gaston Planté in 1859, lead acid was the first rechargeable battery for commercial use. Despite its advanced age, the lead chemistry continues to be in wide use today, and there are good reasons for its popularity; lead acid is dependable and inexpensiveon cost-per-watt base. There are few other batteries that deliver bulk power as cheaply as lead acid, and this makes the battery cost-effective for automobiles, golf cars, forklifts, marine and uninterruptible power supplies (UPS). Adding antimony and tin improves deep-cycling but this increases water consumption and escalates the need to equalize. Calcium reduces self-discharge but the positive lead-calcium plate can grow due to grid oxidation when over-charging. Modern lead acid batteries also make use of doping agents such as selenium, cadmium, tin and arsenic to lower the antimony and calcium content. Lead acid is heavy and is less durable than nickel- and lithium-based systems when deep-cycled. A full discharge causes strain and each discharge/charge cycle permanently robs the battery of a small amount of capacity. This loss is small while the battery is in good operating condition, but the fading increases once the performance drops to half the nominal capacity. This wear-down characteristic applies to all batteries in various degrees. Lead acid has a moderate life span but is not subject to memory as nickel-based systems are. Charge retention is best among rechargeable batteries. While NiCd loses approximately 40 percent of its stored energy in three months, lead acid self-discharges the same amount in one year. Lead acid works well at cold temperatures and is superior to lithium-ion when operating in subzero conditions. Several types of sealed lead acid have emerged and the most common are gel, also known as valve-regulated lead acid (VRLA), and absorbent glass mat (AGM). The gel cell contains a silica type gel that suspends the electrolyte in a paste. Smaller packs with capacities of up to 30Ah are often called SLA (sealed lead acid). Packaged in a plastic container, these batteries are used for small UPS, emergency lighting, ventilators for healthcare and wheelchairs. Because of economical price, dependable service and low maintenance, the SLA remains the preferred choice for biomedical and healthcare in hospitals and retirement homes. The VRLA is the larger gel variant used as power backup for cellular repeater towers, Internet hubs, banks, hospitals, airports and other sites. The AGM suspends the electrolyte in a specially designed glass mat. This offers several advantages to lead acid systems, including faster charging and instant high load currents on demand. AGM works best as a mid-range battery with capacities of 30 to 100Ah and is less suited for large systems, such as UPS. Typical uses are starter battery for motorcycles, start-stop function [see BU-801a: How to Rate Battery Runtime] for micro-hybrid cars, as well as marine and RV that need some cycling. 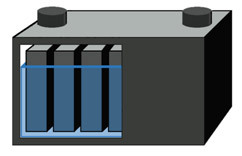 The optimum operating temperature for a VRLA battery is 25°C (77°F); every 8°C (15°F) rise above this temperature threshold cuts battery life in half. [see BU-806a: How Heat and Loading affect Battery Life] Lead acid batteries are rated at a 5-hour (0.2C) and 20-hour (0.05C) discharge. The battery performs best when discharged slowly; the capacity readings are notably higher at a slow discharge rate. Lead acid can, however, deliver high pulse currents of several C if done for only a few seconds. This makes the lead acid well suited as a starter battery, also known as starter-light-ignition (SLI). The high lead content and the sulfuric acid make lead acid environmentally unfriendly. Lead acid batteries are commonly classified into three usages: Automotive (starter battery or SLI), motive power (traction or deep cycle) and stationary. 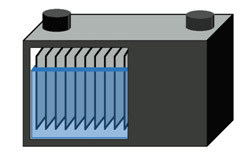 Starter batteries have a very low internal resistance, and the manufacturer achieves this by adding extra plates for maximum surface area (Figure 1). The plates are thin and the lead is applied in a sponge-like form that has the appearance of fine foam. This method extends the surface area of the plates to achieve low resistance and maximum power. Plate thickness isless important here because the discharge is short and the battery is recharged while driving;the emphasis is on power rather than capacity. Deep-cycle lead acid batteries for golf cars, scooters and wheelchairs are built for maximum capacity and high cycle count. The manufacturer achieves this by making the lead plates thick (Figure 2). Although the battery is designed for cycling, full discharges still induce stress, and the cycle count relates on the depth-of-discharge (DoD). Deep-cycle batteries are marked in Ah or minute of runtime. The deep-cycle battery has thick plates for improved cycling abilities. The deep-cycle battery generally allows about 300 cycles. A starter battery cannot be swapped with a deep-cycle battery and vice versa. While an inventive senior may be tempted to install a starter battery instead of the more expensive deep-cycle on his wheelchair to save money, the starter battery won’t last because the thin sponge-like plates would quickly dissolve with repeated deep cycling. There are combination starter/deep-cycle batteries available for trucks, buses, public safety and military vehicles, but these units are big and heavy. As a simple guideline, the heavier the battery is, the more lead it contains, and the longer it will last. Table 3 compares the typical life of starter and deep-cycle batteries when deep-cycled. Lead is toxic and environmentalists would like to replace the lead acid battery with another chemistry. Europe succeeded to keep NiCd out of consumer products, and similar efforts are made with the starter battery. The choices are NiMH and Li-ion, but the price is too high and low temperature performance is poor. With a 99 percent recycling rate, the lead acid battery poses little environmental hazard and will likely continue to be the battery of choice. Table 4 spells out the advantages and limitations of common lead acid batteries in use today. Table 4: Advantages and limitations of lead acid batteries. Dry systems have advantages over flooded but are less rugged. Comments are intended for "commenting," an open discussion amongst site visitors. Battery University monitors the comments and understands the importance of expressing perspectives and opinions in a shared forum. However, all communication must be done with the use of appropriate language and the avoidance of spam and discrimination.